People who live by the sea the from the light. Whether it's because of glare off the water faded carpets and upholstery or the feeling of being baked by the sun, seaside homeowners who put up a phalanx of windows to take advantage of the view often find there's a downside to waterfront living. "Nathaniel Palmer's wife had this problem, and her own solution. Eliza Palmer, married to the 19th century Stonington sea captain credited with discovering Antarctica, had workmen create a clever shutter system to block the light flowing through 9-foot-high windows. 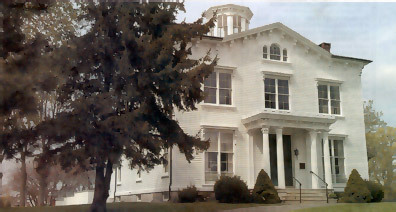 Today, the shutters still can be seen at the 1851 house near Stonington Borough. But they're not as necessary as they once were because of a special window film the Stonington Historical Society, which owns the house, had applied to the glass several years ago. "It helps stop the ultraviolet rays that can cause fading of upholstered furniture wood and carpets, for instance," says Joann Lanieux, curator of the Capt. Nathaniel Brown Palma House "The sun can turn white carpets brown, and it can turn brown carpets almost to white." Museums with valuable antiques certainly have an incentive to invest in window film, but homeowners like Ranja and Jasjit Bindra of Groton have equally compelling reasons. 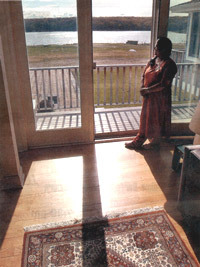 "The sun in the afternoon can be overwhelming as it travels," says Ranja, owner of Ranja Bindra Oriental Rugs on Fort Hill Road in Groton, explaining why she decided to have window film installed by Elmore Associates of Manchester (www.elmorefilm.com). "With all the Oriental rugs in this house, it became almost a necessity." The Bindras live on Mumford Cove, where they have transformed a small ranch that they bought three years ago into a beautiful and light filled space with copious glass. It took two years to build their dream space, and a few months more before they realized they couldn't live with the light After researching other options, the Bindras eventually decided on a window film called SpectraSelect 75, made by Vista, which specializes in residential applications. "With awnings, the sun can still come through," says Jasjit. "And we didn't want to have big, heavy draperies because that would block the view." "The whole point of window film is to maintain the view without having to cover it up," agrees Wendy Peterson of Gales Ferry, a sales associate with Elmore Associates, a company that has been selling window film for 40 years. The window film used on houses, she says, consists of metallized coatings and microthin film layers, bonded by adhesives, that can reduce glare and fading by 70 percent or more. It differs from car tinting material, which consists of dyed polyesters and doesn't have the longevity of residential window film (Elmore Associates offers a lifetime warranty). Peterson says window film can reduce solar heat gain, helping improve the efficiency of air conditioning systems, and it cuts the glare on computer screens. A darker film, produced by LLumar, can get rid of those "hot spots" under skylights, she adds. 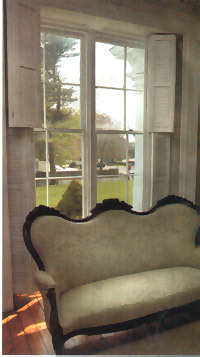 In addition, window film makes glass easier to clean because dirt doesn't adhere to it easily. And the film also provides protection against glass breakage in the case of a storm or hurricane Other types of film can provide privacy in bathrooms, for instance, or enhance glass with decorative effects. The type of window film you need depends on the type of problem you have, Peterson says, A spectrum of tints from light to dark is mailable with the darker hues generally reserved for office buildings. "With the light, neutral Vista films, you wouldn't know it was on the glass," she says. "It's that crystal clear." The Bindras chose a film in the low midrange of darkness, and they enjoy the effect so much that Ranja now displays samples of the product at her store and recommends it to customers. "It can reduce fading by 40 to 75 percent," says Peterson, who says the minimum installation charge is $150 and the cost is based on the number of square feet that have to be covered. "When a customer says 'What's it going to cost," I'll say, "It's a lot less expensive than to replace an Oriental rug, a couch or a piece of artwork,"' Peterson says.